It is a pertinent question because Thomas Nelson, which publishes the NKJV, the so-called “New King James Version”, claims that this new translation is “the fifth major revision” of the KJV. I have some of their promotional literature in which this is claimed. To answer the question briefly, the answer is zero. 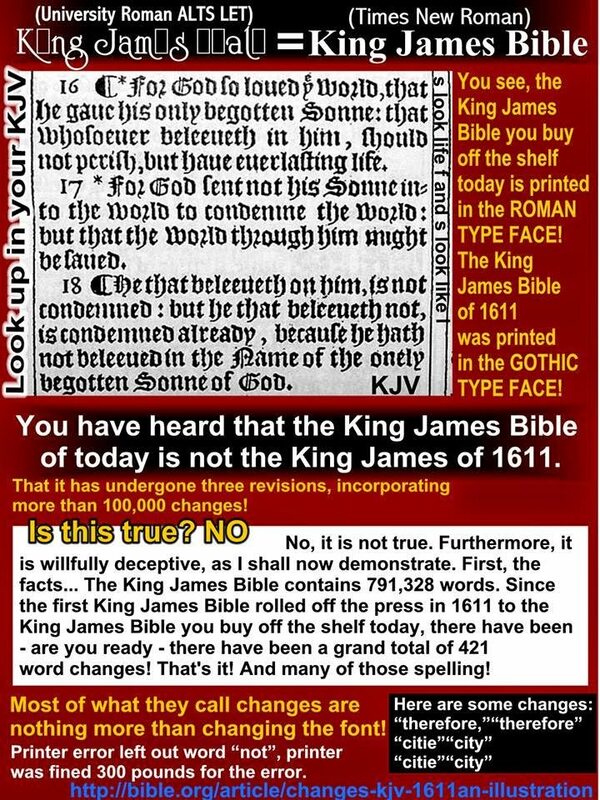 The KJV that we have today is the same as what was published in 1611. The claim is often made that there have been four major revisions encompassing over 75,000 word changes. The first part of this statement is true; the second is false. Actually, there appear to be many more than 75,000 changes. There have been numerous editions of the KJV since 1611. More about the so-called “four major revisions” claim at the end. The KJV available today may not look the same as what was originally published in 1611, but it really is, once you make allowances for three kinds of changes: proofreading (what I call typos), printing or type (font), and orthographic (spelling). In addition, there have been a number of changes of punctuation and case. All of these changes resulted in different editions, but no revisions. This is not engaging in semantics. A given work is revised if the author (or translator) didn’t like everything in the original and wants to make substantive changes. However, to follow this example, if the publisher did not accurately transcribe the author’s manuscript in the original edition, then the corrections would be incorporated into a second edition, not a revision. This second edition would simply be what the author originally wished to say (assuming that all of the printing errors were purged). And this is the case with the KJV. Of the changes of the first kind, there were about 400 typos in the 1611 edition. Considering how big the Bible is and that they lacked word processors and spell-check-on-the-fly, that is a remarkably small number. I have a copy of a book here at home in which all of these typos are cataloged (The Authorized Edition of the English Bible (1611); Its Subsequent Reprints and Modern Representatives, published in 1884 by Prebendary F.H.A. Scrivener, M.A. D.C.L., LL.D.) and have looked at all of them. The humble shall see this, and be glad: and your heart shall live that seek good. This typo was corrected in 1617. At that point, most of the KJV translators were still alive. Bear in mind how labor-intensive printing was back in those days. Johann Gutenberg, to whom invention of the moveable type printing press is usually attributed (A.D. 1450), published the Bible in 1456. However, little had changed in the intervening 161 years. Printers had to set type into the plates by hand from boxes and boxes of metal type, one letter at a time. I am quite amazed that the first KJV Bible had as few typos as it did. Most modern translations of the Bible and other books of comparable size don’t do much better. Some do worse. The 400 or so typos were noted and corrected in subsequent editions, most within a few years. About 100 were corrected by the time of the second printing of the original KJV edition (still in 1611), and almost three fourths were corrected by 1638. As may be expected, it has proven impossible to keep errors like these from creeping into later printings and editions.